If you want to make your Eurorack oscillators sound huge, and add some wave mangling along the way, the latest pairing from AJH Synth will sound super in more ways than one. 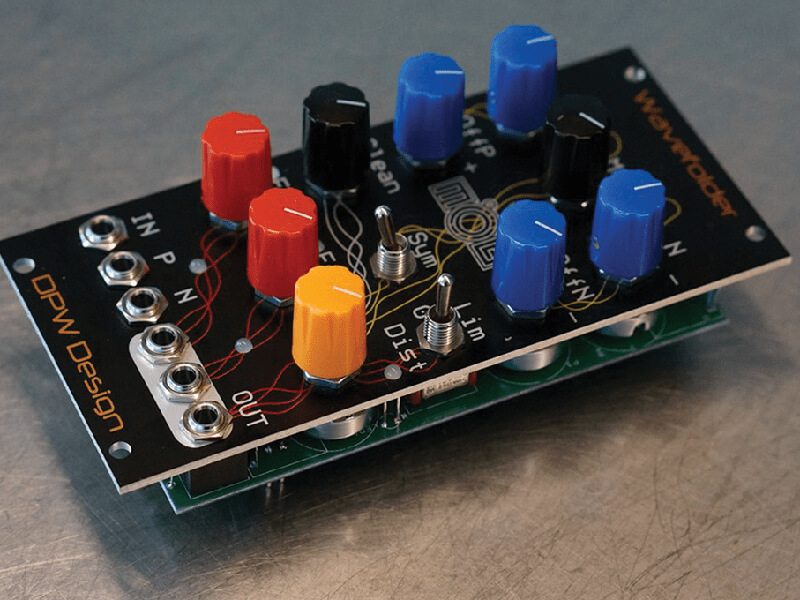 Those of us lucky enough to visit Superbooth were tempted by two modules from AJH Synth, allowing us to take an existing VCO signal and do interesting things with it. 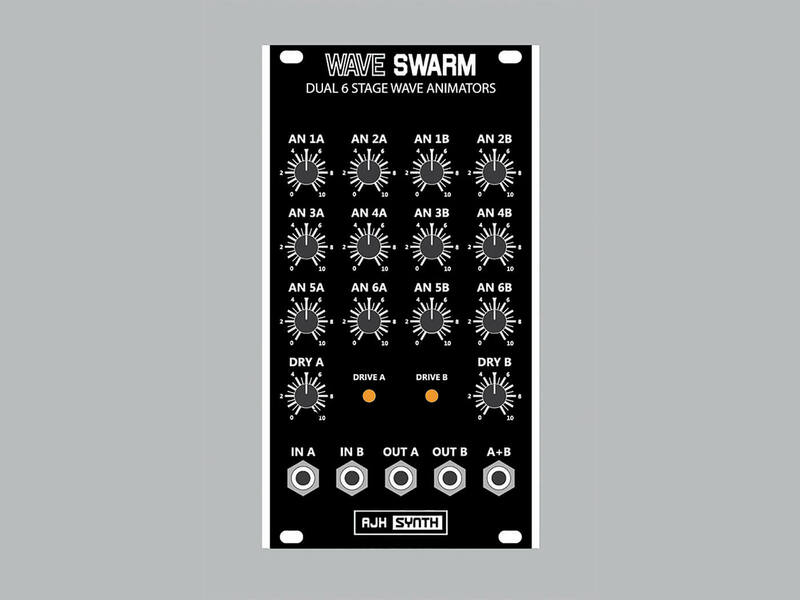 The Wave Swarm is a Dual 6 Stage Wave Animator, which takes an incoming signal from a VCO and adds movement to get an effect like the super saws made famous by the Roland JP-8000 back in the 90s. 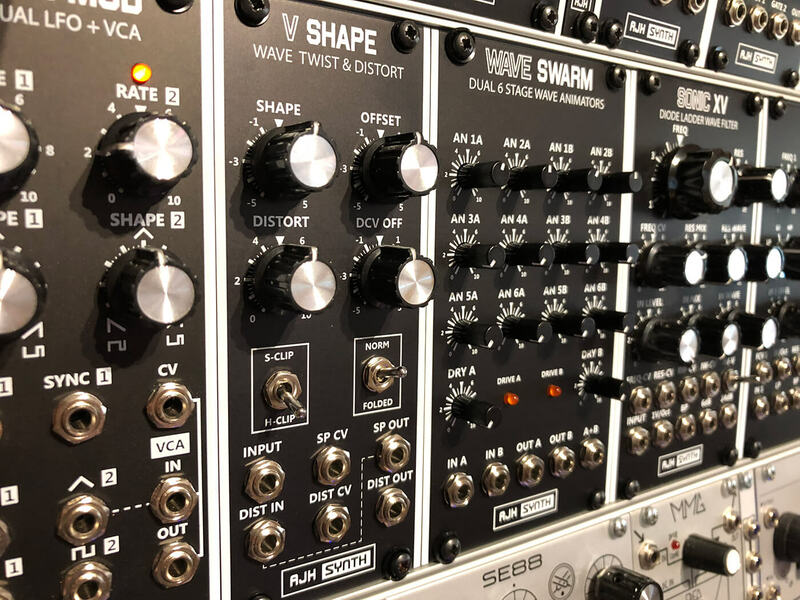 Wave Swarm has two inputs for two oscillators to be processed individually, or the singular use of input A will allow for 12 stages of processing. Each stage offers volume so more prominence can be given to a single animation. The movement created by each sees the wave gently rocking on a scope, while each animation element oscillates at a slightly different rate, creating the overall swarm effect. What makes this more enticing is the two channels, or a combination of them into one. Six Animators sounds big, but bringing all 12 into play is scary! Thanks to the summing circuitry, soft clipping will occur when the signal gets hot, rounding off the bottom and top of the wave nicely, to create a pleasant distortion. It’s not designed to work with square or pulse waves, but it does create interest with them. Even when no input is present, forms of clicking occur which I found hypnotic. 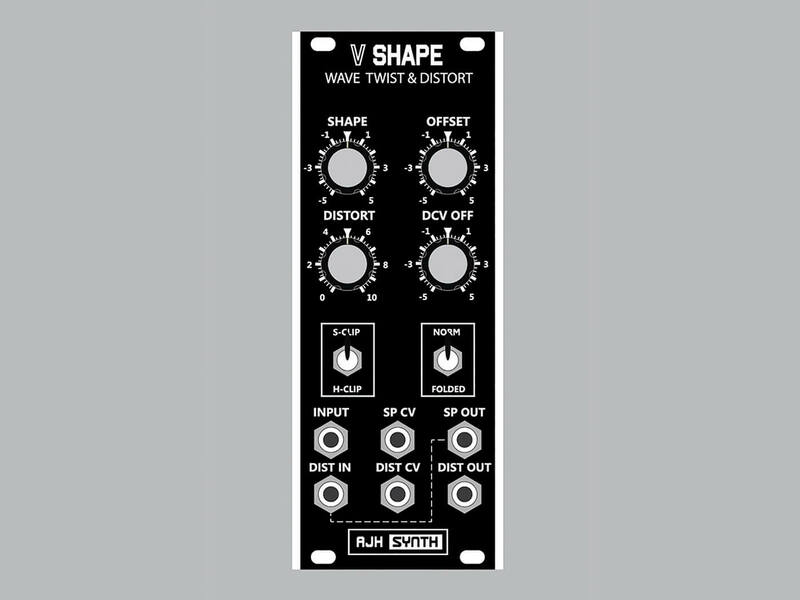 The V Shape module is a wave twister and wave-folding/distortion unit, with these available individually or summed through an analogue design and signal flow. By taking a saw, the V Shape can mutate the shape toward a triangle tone, like a PWM for saws, triangles and the like. Again, this is not really for square- and pulse-based sources, but place a shark-tooth wave from an AJH VCO through it and the resulting diversity of shape is inspiring. 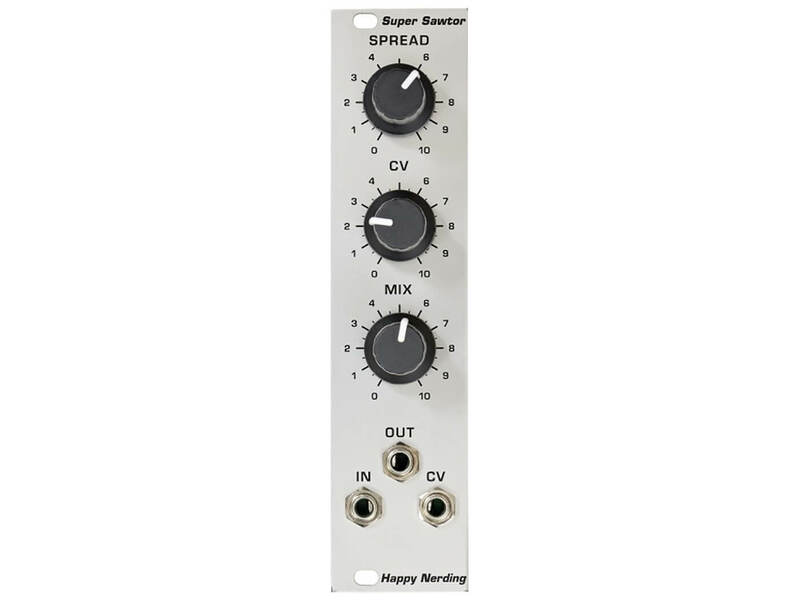 Manual shaping is available, although the patching of a source such as LFO immediately switches the manual amount pot over to a CV amount control, and you’ll want to place this under external CV control pretty quickly. There’s a helpful offset to allow the user to set the start point of twist. The folder and distortion sections are capable of creating some great tones, either under soft or hard clipping. There is no on or off here: instead, plenty of attenuation and play in amount, to create the tone. It is a perfect module for interesting and different tones. Although there are similarities between these two, they both have very different calling cards and complement each other. The selling point is in the complexity of what can be achieved from each and from the pairing of the two. This is a basic but effective alternative to the Wave Swarm that will take an incoming wave and super-size it, while offering CV control over the amount. It’s also pretty cost effective and fits into a small 6HP module. A favourite with us, the DPW Wavefolder delivers a large amount of control in a module which sounds outstanding, but does require some getting used to, to get the best out of it operationally and sonically. If you lust after that big super-saw sound, this will tick that box very quickly, while offering great control and two-channel operation. The combination of wave mangling and distortion found in the V Shape makes it a very desirable model to have around.